Well as most of you know Neal from Spool Photography and I went down south and managed to capture some absolutely magnificient light. However, on Sunday I decided I wanted to simplify things and experiment and to try take a shot that required no Photoshoping what so ever. I wanted saturated colours, slightly blurred water movement, not a great deal and yet still have a sharp image. I think I came pretty close. I had to do some creative cropping but that is it. So how did I do it? Firstly, I utilised a Hoya 5 stop ND filter to ‘slow’ things down in other words to allow me to leave the shutter for longer, I figured that would blur my water movement and alllow the colours to really soak in. Then I put on a polarising filter to take some of the glare away from the subject. In reality this would allowed me to have the shutter open even longer. You can buy filters from Singh Ray that do the same thing now but as I said I was just tinkering / experimenting. I think I got pretty close to my objective, which was to produce a decent shot in camera that required almost no Photoshopping. I notice that a lot of other people are trying to simplify their photography. What are some of the steps that you are taking to simplify your photography. I’m guessing Lightroom will be mentioned heaps. As there was only one bikini shot request I’m afraid I’ll have to archive the photo. Thank You for visting my post. 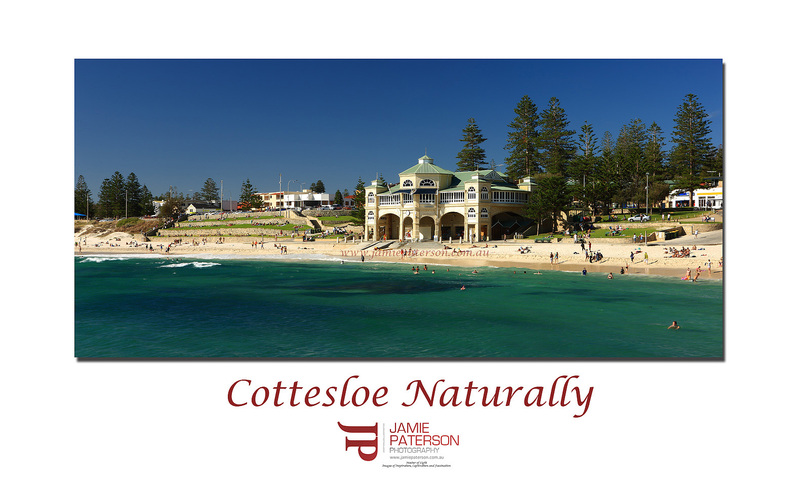 This entry was posted in Australian Landscapes and tagged australia, beach, canon, canon 1ds mkIII, cottesloe, image, Jamie Paterson, landscape, long exposure, ocean, panorama, panoramic, perth, photo, photography, photoshop, seascape, surf, surfing, water, waves. A lovely shot taking me right back to that lovely beach. A polariser on a sunny day like that works wonders. I’m not really trying to simplify my photography and I’m not really interested in reality anyway. I do streamline my digital workflow as much as possible using Lightroom but I don’t mind spending hours or even days getting the look just right. I do always try and get the most I can out of the shot in camera using filters etc, mostly to maximise quality by collecting the data I want on scene instead of manipulating my way to it in Lightroom and Photoshop – also to save time on Post Production. Getting the shot right the first time will always give you the best quality. I’m impressed Jamie. Great result. I’m addicted to post processing. I generally do it even to my stupid happy snaps, since I love the instant emotive change that comes with something as simple as bumping up the contrast a couple of notches (then add a bit of fill light, adjust blacks… i’m awful really, i could edit all day). My personal project in the next few months is to simplify my editing process: adjust as little as possible. It starts with the next wedding, this weekend. I’ll keep you posted on how i go. Really nice shot Jamie. I like the idea of using the ND filter to slow your shutter speed down – a nice simple technique. Photos have been post processed even before digital – the darkroom printing process has always involved a large amount of image manipulation; although probably not to the extent that occurs with digital imaging. A far as simplifying goes, I think the goal of minimising post processing is an excellent one. We should all aim to take the time to get the composition and exposure ‘right’ (very subjective, I know) – then we can spend more time taking photos and less in front of a computer….! Hi Flemming and Charelene, firstly thanks for commenting as always. I’m the same, I’m a heavy post processor of my photos, I get an idea in my mind of how I want a photo to look and just go for it. One might even argue that me using a polariser and 5 stop ND filter is processing the image. So I was just experimenting that you can take a half decent photo with minimal equipment and then showed him the image. Hopefully that will give the person inspiration to start at least trying to shoot stuff. It was fun trying, but I’m jumping right back into the post processing pool. As for simplifying things? I find myself doing more and more complex things in Photoshop but sometimes forget to do the basics. So I have written down a list of a few steps I have to do before starting any real post processing and a list of steps I have to take when finishing. That is all I’ve done to try and simplify things. Thanks for stopping by and welcome to the blog. Its certainly an extremely subjective issues. I like to think I get the compositiona and exposure right and then ‘create an image’ via PS. I find with someof my more images with little PS work, that simple, well used levels layers can be all you need! this is really nice Jamie. great angle, and the blue is stunning. how slow did this actually slow it down to?? the swimmers are still incredibly sharp, even at 1/2 a second i thought they would have started losing it a bit. levels, slight sharpen and that’s about it. i feel it helps have a more “traditional photo” feel to the image- which is what i like. quite different to the “modern style” where alot of the images are extra sharp, have a higher dynamic range, more saturation etc. i love looking at these images, but i aim to get a different look for my own shot’s. Nice shot Jamie and i’m a bit of a minimalist myself so I know where your coming from. i have a similar shot from the same angle on my blog taken not that long a go..check it out. Nice shot, but why not do this early morning or late evening, you’ll get even better light!! !